Springtime can lead to some volatile weather across the country, especially in the South. It can lead to breaking news coverage featuring cut-ins during network programming. It happened this past weekend in Mississippi, where one meteorologist got our attention by snapping his fingers at someone off-camera. It happened again during The Masters on Sunday, and in this case, it led to viewer anger and in some extreme cases, death threats. I’m about to walk down to CBS46 and pull the plug on their weather machine. I live a block away from @cbs46. I’m driving there now to murder somebody. The cut-ins led some people to issue death threats to Dorsey, and she responded on Twitter. It’s a fine line that stations have to walk, determining whether an alert is so important they need to break into programming or run a crawl on the bottom of the screen. WGCL thought it was necessary to break into the Masters and risk incurring the wrath of viewers. But sending Dorsey death threats is not right. She’s providing a public service and yes, sometimes the timing of the cut-ins are bad, but you’d rather go with safety here. In Washington, D.C., CBS affiliate WUSA also broke into programming, but it was during the taped replay of the Masters. High winds and rains left residents without power and there was a tornado warning in a D.C. suburb. You may notice that Shutt tagged Michael Wilbon in his tweet. Why did he do that? Apparently Wilbon was watching the Masters on tape delay and wasn’t happy over the cut-in. Self-indulgence is wanting a replay over other people needing potentially life-saving information. This is painfully short-sided & feeds an unnecessary & uneducated pushback against local meteorologists/journalists who are doing important work. You should know better, Wilbon. 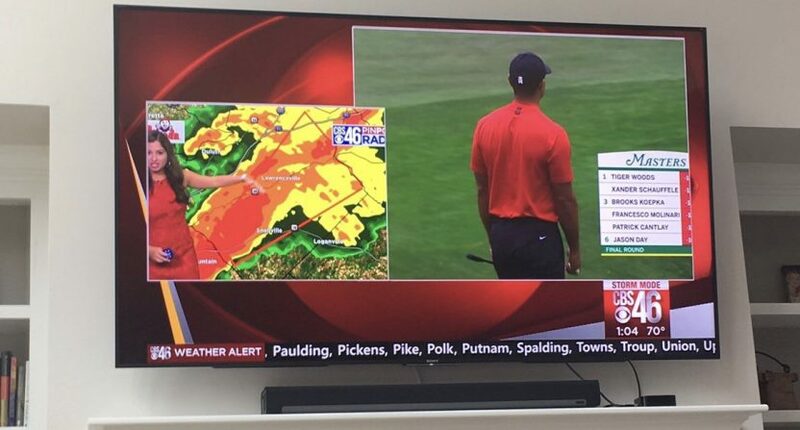 Viewers were not happy over weather coverage, but if a tornado hit without any live warnings, there would be outrage the other way. Yes, we have phones with emergency alerts, but how many people have actually turned those alerts off? So for local stations, this is still the best way to reach their audiences to provide a public service.